Over 4 billion people around the world face unmet needs in core areas such as food, water, energy, health-care and housing. The market potential for these low-income populations is huge: Approximately 4.5 billion low-income people globally represent an annual purchasing capacity of US$ 5 trillion (PPP), with India, East Africa and South East Asia accounting for a sizable chunk of this market. Yet servicing this market is fraught with challenges, including customers’ limited ability to pay, poor infrastructure and latent demand. Catering to this market requires frugal innovation, which is about transforming adversity into opportunity, enhancing value and ultimately doing more with less, thereby impacting more people. Many firms – both startups and corporates – have begun to design frugal, market-based solutions that include product and business model innovations to meet the unmet needs of billions of underserved customers. In Kenya, for example, Pad Heaven makes re-usable sanitary towels from banana fibers, and Ecopost uses plastic and agricultural waste as a resource to manufacture sustainable materials for the building, construction and transport industries. India is also a hotbed of frugal innovations, which spread across sectors. For example, Saral Designs markets an automatic machine that allows organizations to produce low-cost sanitary napkins, Bhagwan Mahaveer Viklang Sahayata Smiti provides the Jaipur foot – a low-cost prosthetic leg, and Banka Bioloo sells sanitation systems that eliminate the need for off-site disposal of human waste. Each of these products highlights how such innovations can be game changers. But frugal innovations are not just about products: Great potential also lies in business model innovation. Frugal innovations in services can include deep specialization in a niche segment of a huge market, tiered pricing systems and efficient use of human capital. These innovations respond not only to a lack of skilled human capital, but to an institutional void. For instance, Unilever’s small, affordable detergent sachets are priced at a more palatable level for the low-income populations in India and Africa. And Aravind Eye Care’s approach to performing cataract surgeries at large scale without compromising on quality highlights how process innovation can ensure inclusivity and service delivery in a sustainable manner. Frugal innovation is also not limited to low–tech sectors. It can require, or be combined with, frontier science and technology. Products like Swach a high-tech portable water filter developed by Tata, HealthCubed Inc.’s Health Cube – an integrated, tablet-based, portable point-of-care diagnostic test device, and Agatsa’s pocket-sized 12-lead electrocardiogram have demonstrated how technology can not only be an enabler but an amplifier to both product and process innovations. While frugal innovations are commonly associated with developing economies, these innovations are not only for resource-constrained users – and they also address the issue of resource scarcity. The current “take, make and dispose” economy is not sustainable. Economic productivity is already being curbed by the rapid depletion of existing and readily available natural resources. These constraints require a shift in thinking towards a more circular model focusing on resource productivity, and a shift towards a “make, share and remake” model. This will be a key driver towards sustainability for frugal innovations of the future. Principles from frugal innovations are directly applicable to this circular economy, as generating value from waste is common across African and Indian startups. For example, Kodjo Afate Gnikou built a $100 3D printer from electronic waste. And in Europe, the firm Qarnot has developed QH.1, a high-performance computing server that uses “waste heat” from its microprocessors to heat homes and other buildings. 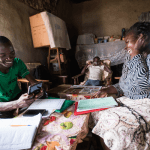 Innovative Finance Models: With new sources of social finance, including the emergence of innovative blended finance models, the cost and risk of investing in frugal innovations can come down. Returnable social capital to catalyze private sector investment through instruments like pooled investment funds, guarantees and impact bonds can facilitate scale. New Forms of Collaborations: Innovative small businesses and early-stage enterprises understand local contexts, adopt fail-fast models and move quickly. Corporates with resources and networks are able to scale viable innovations faster. Corporates are increasingly connecting to these smaller innovators through crowdsourcing solutions, hackathons and challenges. But the success of these small innovator/big corporate collaborations depends on process management, with clearly defined problem statements, an appropriate mix of innovators, and post-collaboration action. Business Support for Innovations: Frugal innovators face distinct challenges, including a lack of access to capital, talent and markets. They need assistance to turn their ideas into scalable commercial business opportunities, such as technical and operational support for market segmentation, commercial viability and distribution. Inequity is the greatest and fastest growing challenge facing humanity today. The world’s 42 richest individuals have more wealth than the poorest 50 percent of the global population. Innovative, frugal solutions developed by entrepreneurs can help address this challenge, leading to a more equitable future. But to achieve this goal, an ecosystem approach is needed, with integrated support from a variety of players – from investors and donors to corporates, mentors and service providers. With this support, frugal innovators will be better able to market and scale their solutions and reach vulnerable communities. Dr. Rajat Chabba is Lead – Healthcare Innovations at Intellecap. Sheena Raikundalia is a Senior Advisor at Intellecap. Photo courtesy of meenakshi madhavan.